Very old and elegant fragance designed for masculine and well dressed gentlemen. 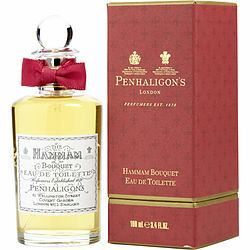 Penhaligon's Hammam Bouquet was introduced nearly 150 years ago as a fragrance for men but I suspect this would be considered strictly a feminine fragrance now, except for the most confident and elegant of men who could, indeed, carry this off. For women though, Hammam Bouquet is a grand incense and sweet rose fragrance with a rich, woody base. Reminds me most of Hermes' Rouge with its churchy incense feeling. Very respectable longevity. A complex fragrance that's refreshingly different from current florals and fruity/candy fragrances smelled everywhere on everyone.